Nestled on the beach, this Cayo Santa Maria property is 4.8 mi (7.8 km) from Cayo Santa Maria Dolphinarium and 5.5 mi (8.9 km) from Playa Las Gaviotas. Nestled on the beach, this Cayo Santa Maria property is 5 mi (8.1 km) from Cayo Santa Maria Dolphinarium and 5.7 mi (9.2 km) from Playa Las Gaviotas. Situated in Cayo Santa Maria, this hotel is 3.4 mi (5.5 km) from Cayo Santa Maria Dolphinarium and 5.5 mi (8.9 km) from Playa Las Gaviotas. Travel is life, and smart cheapsters know you don't need a bucket-load of cash to do it. So why don't you make Cayo Santa Maria your next extraordinary adventure? 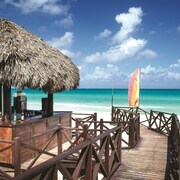 It's situated in Cuba, 4 miles away from Cayo Ensenachos. At CheapTickets, you won't have to stress about securing the thriftiest price. We've figured it all out for you, and we haven't compromised on quality for accommodations, flights and awesome experiences. Would you love to save as much as $481? Simply combine your hotel and flights. With 500 airline partners and 500,000 properties globally, you have a world of choice at your fingertips. How's this for putting you at ease? If you find your deal for a cheaper rate within 48 hours of booking it, we can meet that price and refund the difference. That's what we call our Price Guarantee. Cheap deals and fabulous rewards — it doesn't get much easier on the wallet than that, does it fellow cheapster? Simply book your flight with us and you'll save lots on your next eligible CheapTickets hotel stay. You're just a few clicks away from reaping the rewards. You'll save on all eligible bookings, not to mention extra scrimpy bonus offers and perks that are guaranteed to have you smiling ear to ear. Just sign up for free or log in, join CheapCash and you're up and running! 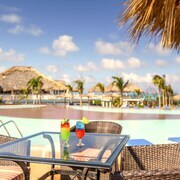 We know you appreciate cheap, so why not book a rental car in Cayo Santa Maria? It's not only a convenient way to travel around, it'll save you dollars too.